Before I can permanently mount the "rocks" around Hochwaldtunnel, I need to build the actual tunnel tube. The tunnel portal is from Faller's premium series and made from foam. 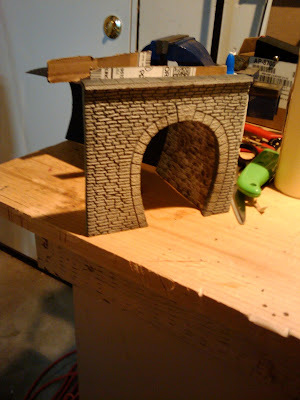 While the visual effect of the stone work is pretty good and it's easy to work with, overall I'm not particularly impressed by this tunnel portal. The foam is quite brittle, and I managed to break the portal near the crown stone. You can see the "fix" in the second photo below. For the first part of the tunnel liner I'm using Noch granite wall stone paper. Yet another product I'm not impressed with, so I'm wasting it on the insides of tunnels. It has a nice stone structure embossed in the paper (contrary to some of the truly awful Faller stone papers), but the stone color is quite nasty, and to top it of, the sheet has a shiny finish (how lame is that?). When I paint the tunnel portal in the next step, I'll also paint the liner fading to black in the back. After the stone paper is plain old black construction paper, cut to fit. I like using construction paper inside tunnels since it has a flat finish, is reasonably sturdy, while still flexible enough to bend out of the way to gain access in emergencies. And of course, it nicely creates the "pitch black" look of a tunnel as demonstrated in my first tunnel built last summer. Since Hochwaldtunnel butts up against the room wall, the track inside is curved, and I need to be able to access the tunnel from underneath the layout, the tunnel "tube" is modelled only on the right hand side of the tunnel. The left hand side is open for access. Because of the room wall, one can't see the left hand tunnel wall. 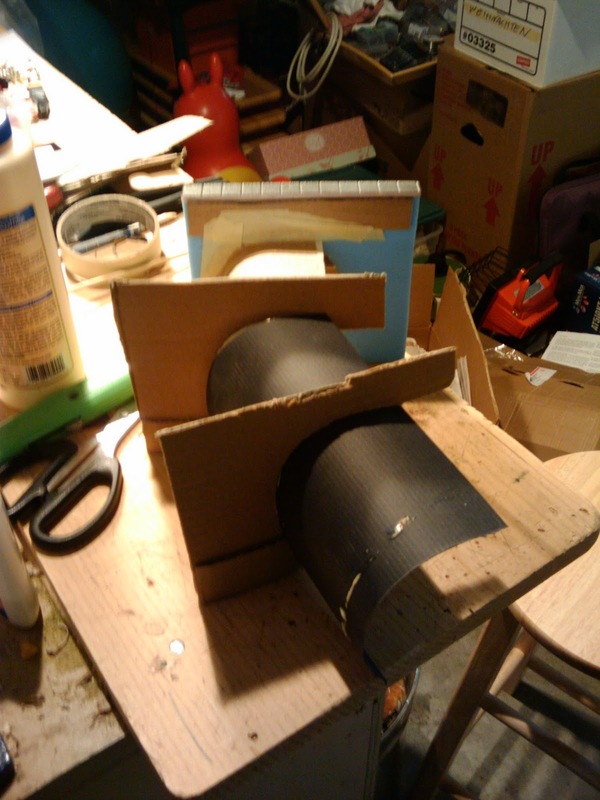 I will likely make it just a "curtain" of black construction paper once the tunnel is installed. The last photo from the top nicely shows the curved arrangement, and how the black construction paper acts as view block for folks attempting to look straight into the tunnel portal. I made the ribs supporting the paper tube from corrugated cardboard this time. The plywood ribs used last time are very sturdy, but the extra sturdiness wasn't really worth the additional effort compared to cardboard. 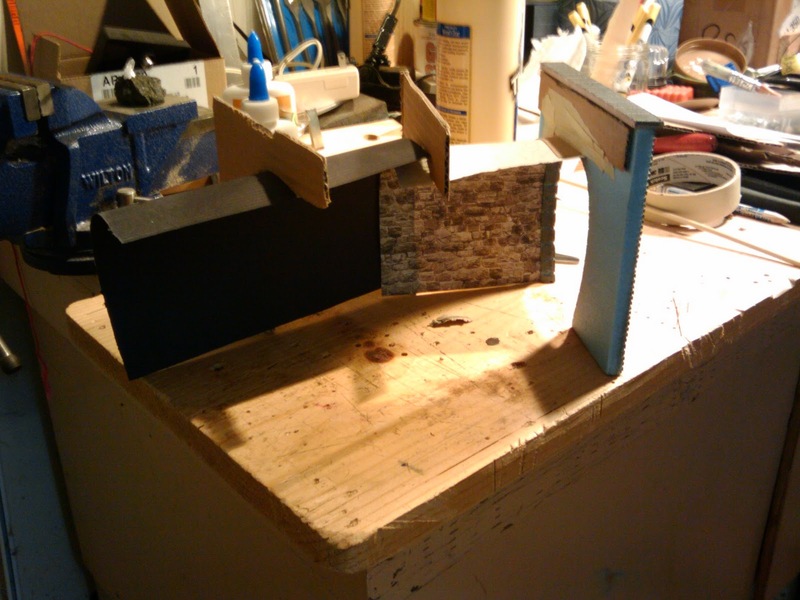 I glued everything with Titebond II, a waterproof wood glue, that develops a good tack quickly, dries clear, and works very well with most porous materials.